Research by the White House Office of National Drug Control Policy shows the loaded words used to describe drug addiction, such as "clean" vs. "dirty," can actually drive people away from getting help, The Huffington Post reported in March. The same is true of terminology used to describe mental illness, where phrases such as "unsuccessful suicide" can exacerbate rather than improve the dialogue surrounding suicide and depression. Mental illness cuts across a wide swath of society. One in five Americans will experience a mental health issue in their lives, according to the U.S. Department of Health and Human Services, and many say they feel stigmatized for their illness by friends, family, strangers and the media. 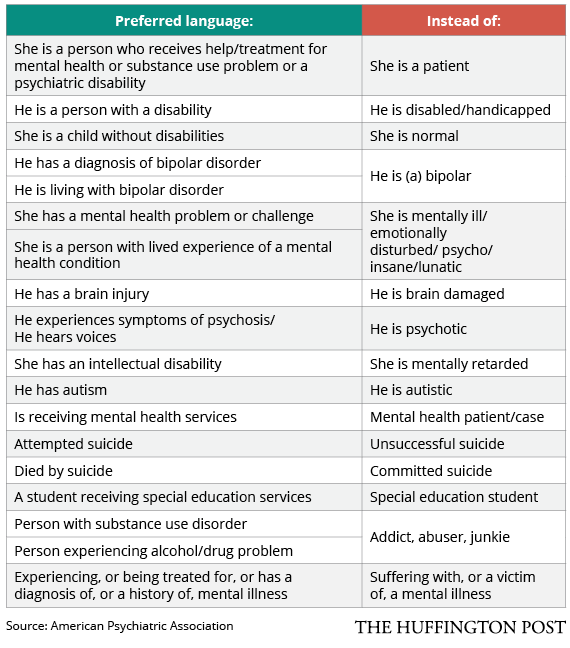 Because media reporting has a large impact on the public's perception of mental illness and can be fraught with tough language choices, the American Psychiatric Association (APA) put together a rubric to help journalists write responsibility about mental illness and suicide. Many in the field of mental health hope it'll serve as a guide for everyone. "Words are very important," Michelle Riba, MD, a clinical professor of psychiatry at the University of Michigan Health System, told HuffPost. (Riba is also a former president of the APA, but did not have a hand in compiling the organization's mental illness reporting guidelines.) "Let me just say that this is not just for reporters. I think this helps us all think about ways to talk about these issues and communicate." One of the most important changes that can be made when talking about mental illness is to stop labeling people as diseases. Instead of saying someone is a cancer patient or a schizophrenic, for example, the language should be "This is a person who has breast cancer" or "This person has schizophrenia." There's a phrase for this type of humanizing sentence construction: people-first language, which Mental Health America describes as "speaking and writing in a way that acknowledges the person first, then the condition or disability." "It helps people understand that the person isn’t the disease, the person has the illness," said Riba. "It doesn’t stigmatize the person -- it gets to the point that the person has something that needs to be evaluated and treated." Riba also noted that the term "substance abuse" was dropped from the latest addition of the Diagnostic and Statistical Manual of Mental Disorders, which mental health professionals use to determine common language across the profession. The new terminology will be "substance use disorder." "Use of terms more in keeping with this medical malfunction, such as describing an affected person as an individual with, or suffering from, a 'substance use disorder' -- as opposed to a 'substance abuser' -- may decrease stigma and increase perceptions of a need for treatment," John F. Kelly, associate professor of psychiatry at Harvard Medical School, told HuffPost in March. One way to frame conversations and reports about mental illness is to think critically about the goal of the conversation or report. "The message that you’re trying to convey is often very important," Riba said. "Then the words will follow."